View the full rage of Chocotale bars with logo here. 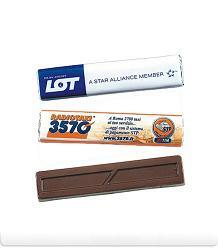 Advertise your business details and your logo aboard our Chocolate bars with logo today! Then hand them out to your customers as a promotional giveaway! This is from our great new sweets and confectionary department of Calendar Lady Promotions. 100g chocolate bars with full colour printed wrappers. Other promotional and personalised items besides our Chocolate bars with logo click here. To find out more about our Chocolate bars with logo click here and fill in the contact form and we'll get straight back to you.